This fall, Cirque du Soleil will bring their touring arena show, OVO, to Orlando’s Amway Center September 21 through 25. Tickets are on sale now, but we’re going to give you a chance to win some in this post. Valentine’s Day will be here before you know it. And soon after that, you’ll want to look your best for springtime holidays (Easter is March 27) and get ready for gift giving for moms, dads and grads in May. 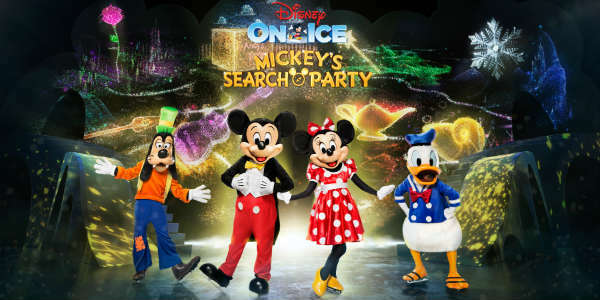 We want to help you out by giving you a chance to win a $50 gift certificate to the Lake Buena Vista Factory Stores in Orlando. 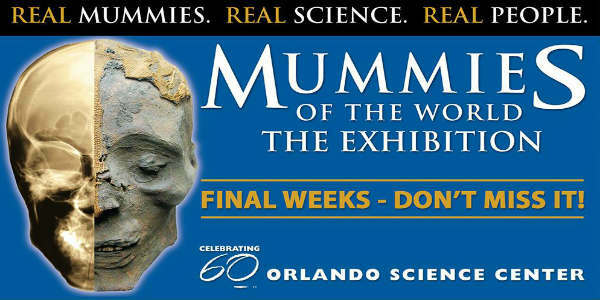 The popular Mummies of the World exhibition is wrapping up its run at the Orlando Science Center, and we have a 4-pack of tickets to check it out before it closes on November 29. The tickets will also allow you and your guests to explore the rest of the Orlando Science Center, including films in the Dr. Phillips CineDome. There are four floors of edutainment to enjoy, with exhibits for all ages. It’s almost August and that means it’s time to start thinking about back to school shopping for most families. 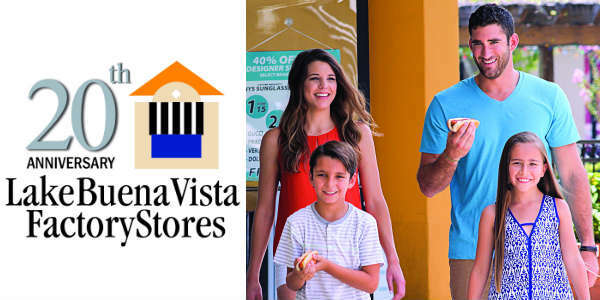 We want to help you out by giving you a chance to win a $50 gift certificate to the Lake Buena Vista Factory Stores. The Florida Sales Tax Holiday will run from Friday, August 7 to Sunday, August 16, and you can stretch those savings even further at the Lake Buena Vista Factory Stores, where shopping is hassle-free and you can find can find factory-direct premium quality merchandise at savings up to 75% off (and sometimes more). Parks are some of the best places to build fun family memories, and you can make some more on National Park Trust’s Kids to Parks Day 2015, which takes place Saturday, May 16. The National Parks Trust is dedicated to perserving local, state, and national parks, and it wants 500,000 people to sign the pledge to take their kids out to a park that day. To sign up, visit kidstoparks.org. As a bonus, when you sign the pledge, you also get a chance to win a Nikon COOLPIX L830 camera. Nitro Circus Live is Coming to Amway Center May 9 and We Have Your Chance to Win Tickets! Action fans get ready! Travis Pastrana Presents Nitro Circus Live is coming to the Amway Center on Saturday, May 9, and we have your chance to win tickets! Nitro Circus Live is an action sports worldwide phenomenon that features more than 40 of the world’s best action sports athletes. They will be performing daring and record-breaking stunts in freestyle, motocross, BMX, and skateboarding. It’s Spring in Florida, which means it’s time to start thinking about getting clothes to help you enjoy the warmer weather. To do that and save money, head to the Lake Buena Vista Factory Stores. At the Lake Buena Vista Factory Stores, you can find factory-direct premium quality merchandise by brand names, at savings of up to 75% off (and sometimes more). There’s easy store front parking, too, which makes getting in and out easy. To add to the savings, the mall will be holding a sidewalk sale the weekend of April 10-12, where stores will have merchandise at extra savings. Kennedy Space Center Visitor Complex and Astronomy Magazine are partnering to host the Great Balls of Fire Contest, giving away a 9.6-pound authentic meteorite collectable and a space adventure trip for four to the Visitor Complex. 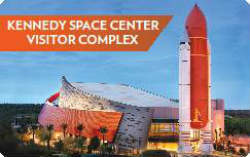 The trip includes round-trip airfare to Florida (provided by Astronomy Magazine), a three-day/two-night stay at the Courtyard by Marriott in Cocoa Beach (provided by Marriott), Kennedy Space Center Visitor Complex admission tickets, Lunch With An Astronaut tickets, and a Kennedy Space Center Up-Close Tour.